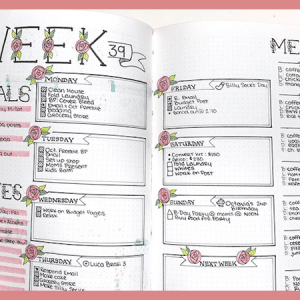 We’ve all seen the pictures of gorgeous weekly spreads with popular bullet journal supplies arranged carefully around them. The question is, are those high-end pens and markers really worth the money? Well, I’m about to give you my two cents. We have all purchased supplies that end up being complete duds. You know that pack of 50 gel pens that was only $9.99? Then you get home, eyes brighter than the lights on a Christmas tree, open your glorious new set of pens and half of them don’t work. NOOOOO! I’m hoping to save you from the agony of dud purchases. Read carefully, and purchase at your own risk. Plus, I’ll show you the items I think are definitely worth the money. 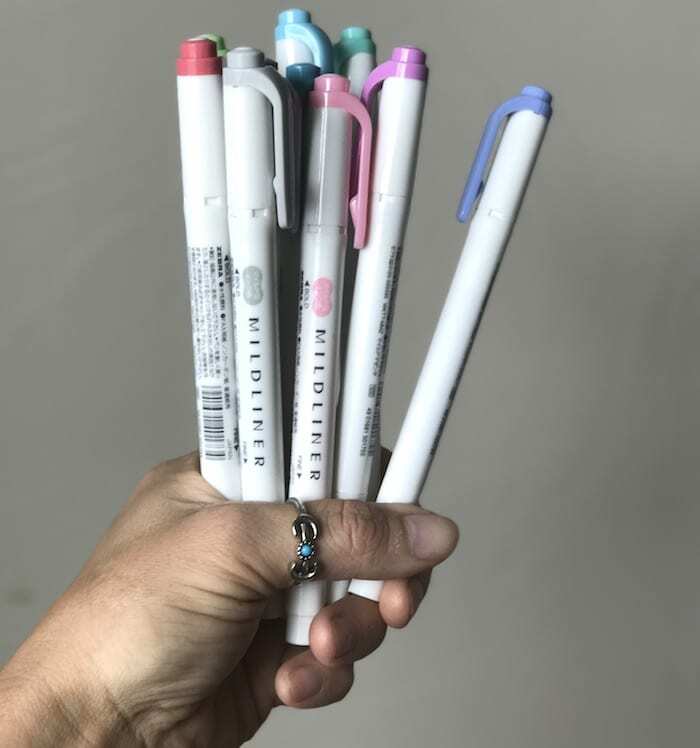 The Staedtler Triplus Fineliners are some of the most common pens I have seen in the bullet journal community. They come in a beautiful array of colors, are fairly affordable, and tend to be very reliable. Also, they’re rather easy to find. I have found them at Target and Michael’s. However, you’ll get the best deal on Amazon.
. You won’t get these colors anywhere else, but you’re going to have to pay the price for the subtle hues. I bought a big pack of gel pens at Costco one day, thinking about all the magical doodles and headers I could craft. As I should have expected, 12 of them didn’t work at all and another handful only worked occasionally. So, when you see those big packs of gel pens advertised on Amazon’s deal page, be wary. If you want the best gel pens, get Gelly Rolls. They are expensive but worth the money. Popular, high-end, but are they worth the price tag? I have three sets of Tombows. Initially, I thought I had made a mistake by purchasing them because it takes time to figure out how to use them. However, after playing with these markers for a few weeks, I fell in love. The color is saturated, you can make very thin delicate letters or very thick, bubbly letters. The brush tip is very resilient; you can bend and push on it and it will spring back to normal, without deforming the original tip. BUT… it is possible to make very similar strokes with Crayola SuperTips. Crayola does not have all the colors Tombow has, though. And, I have heard individual accounts of people having Tombows from 10 years back that still work. That usually isn’t the case with Crayola markers. Glitter and shimmer are all the rage. Understandably so. I freaking love anything that sparkles. So, of course, I bought a pack of metallic brush markers when they popped up under my suggestions on Amazon. My intention was to use them in my bullet journal. And, while they were definitely shimmery, the color was rather dull and the metallic detail wasn’t what I expected. However, on a piece of black construction paper, they were gorgeous. But, for me, that still defeated the purpose. I wanted them for my bullet journal, not construction paper. , are in the same price range. Still, I personally love my Leuchtturm. I have three of them and don’t regret it. They are beautifully crafted, sturdy, and I do love the color options. Another popular, but not quite as easily attainable notebook is the NUUNA. I have lots to say about this notebook. I own two of them, and I paid a pretty penny to get them. They are EXPENSIVE. And, they lack every single feature the Leuchtturm or Scribbles That Matter notebooks offer. There are no page numbers, pockets, elastic closures, bookmarks, or an index. They have a few more pages, at 256. The dot grid is much smaller, which can be a good or bad thing depending on the individual. And, one of the biggest letdowns for me is the softcover. The only things making this notebook worth buying are the unique and stunning designs, the bright white paper, the thicker pages (120gsm), and the edge design. Ultimately it’s up to you if those things are worth it. But in my book, it’s a lot of money to have a snazzy notebook. 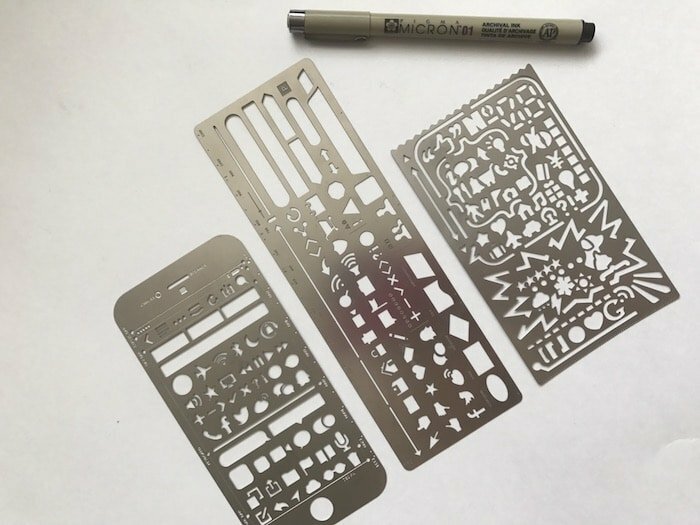 I got suckered into these stencils while on one of Amazon binges. 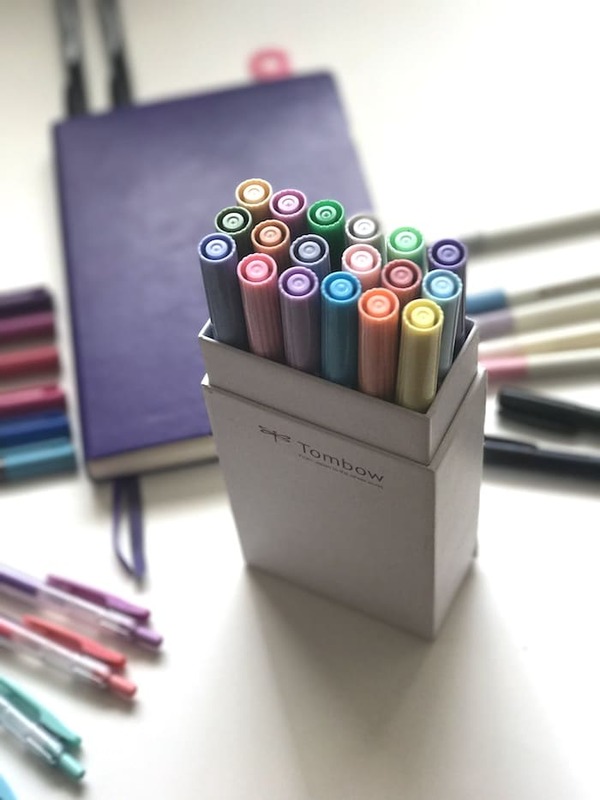 I was beyond stoked to get them and put them to use in my bullet journal. But, to my surprise and total disappointment, they were not useable. The stencils were too small for a fine-point pen and drawn icon looked nothing like what it was supposed to. I think stencils for boxes or circles are great and helpful, but for small detailed icons, stencils are not the way to go. 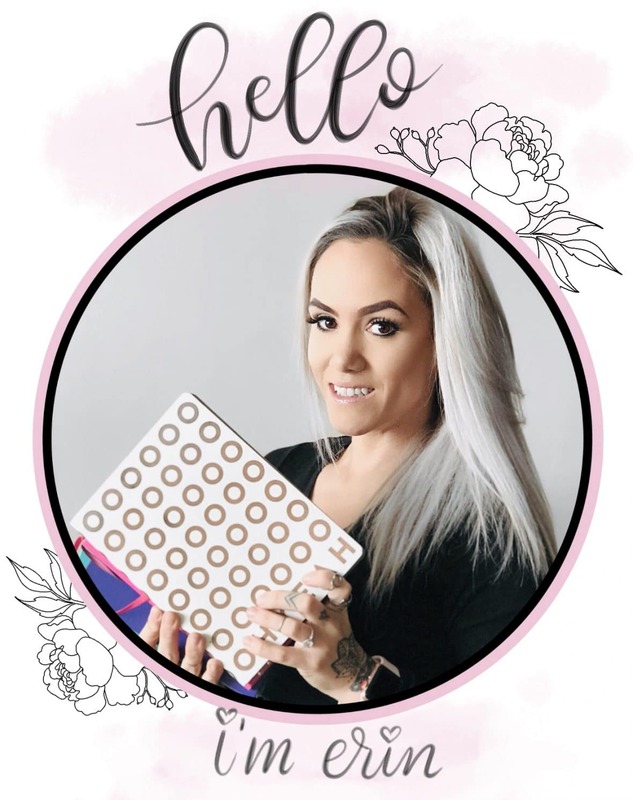 Subscription boxes are growing tremendously. 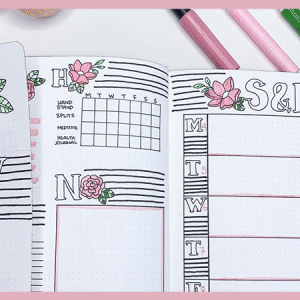 You can get them for anything, including bullet journaling. Pipsticks is a monthly sticker subscription that comes with super unique and fun stickers. 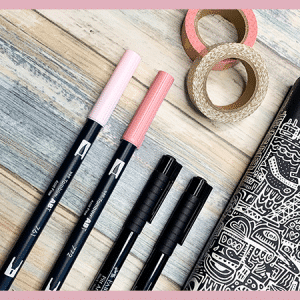 They also have an online shop where you can purchase previous sticker packs, themed packs, washi tape, and more. For roughly $15/month, you get 15 or more sheets of stickers. While that can seem expensive when you’re thinking “they’re just stickers”, they’re not just stickers. They have puffy stickers, metallic stickers, and stickers you won’t find on Amazon or at Michael’s. 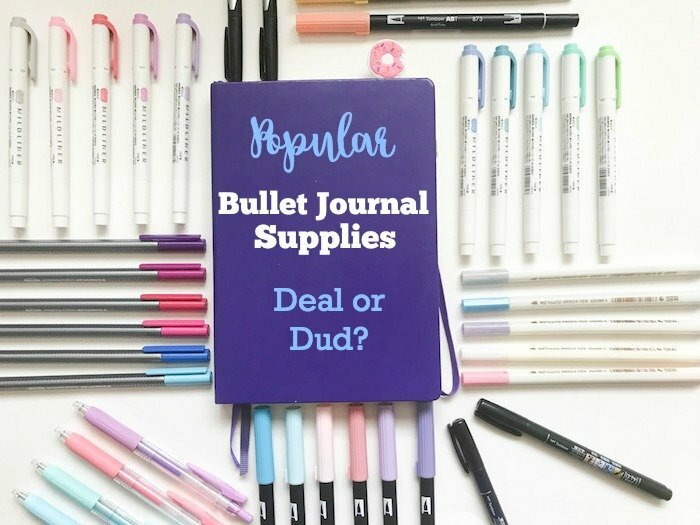 Tell me in the comments what your favorite bullet journal supplies are, and what you bought that turned out to be a total dud.